So what won’t I run without? my flipbelt. Absolutely love it and feel lost without it. It securely holds any little bits I need to take with me and doesn’t move, rub or get in my way. And, when it regularly gets thrown in the washing machine, it comes out as fresh and sparkling as it first arrived. my phone. I didn’t used to run with my phone but often worried about what I’d do if I rolled my ankle. Or, more likely, had run too far and couldn’t be bothered running home. It fits neatly into my flipbelt and is also frequently popped out for pictures of the gorgeousness where I run. my iPod shuffle, yurbuds headphones & awesome playlist. I need music when I run, mostly to mask the gasps and gulps that pass for breathing when I exert myself. My shuffle is perfect because it’s light and unobtrusive and my yurbuds are the best headphones I’ve found so far – they really don’t fall out. my Garmin. There’s a phrase often quoted in my running group – ‘If it’s not on Strava, it didn’t happen’ so my Garmin is a necessary item for me to keep track of when/where/how long I’ve run. And I do love a little statistical analysis while recovering on the couch back at home. And that’s it. I’ve got it down to a fine art – all the bits are kept in the same spot so I can grab them on my way out the door. What won’t you run without? 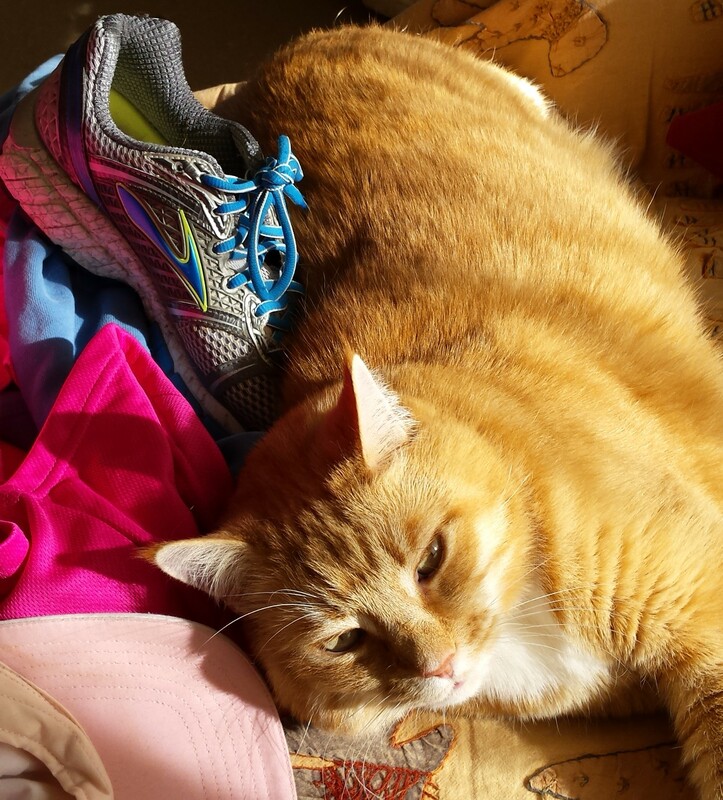 I’m joining in with the Tuesdays on the run linkup party with April from Run The Great Wide Somewhere, MCM Mama and Patty from My No Guilt Life. Today’s topic – running apps. I love being out on a run and, for most of the time, am lost in the moment. Thinking of whatever gorgeous place I’m running through, thinking of my breathing or thinking of how good/bad/tired/energized I’m feeling. However, towards the end of a run, I will admit that my thoughts sneak toward that moment I really enjoy – downloading my data from my Garmin to my various trackers of choice. This one is a means to an end – I only use it because I have a Garmin and this (along with Garmin Express) is how I get the information off my watch and into a useable form. The upload is temperamental but I can’t give up my Garmin because the watch itself is fabulous. So I persist. But I’ve never actually explored the features of Garmin Connect so can’t really comment on it. I’m a recent convert to Smashrun, thanks to reading about it on a fellow parkrunner’s fabulous blog. While it has many features that are the same as all the other running tracking tools out there, I just feel like it does it better. And cooler. It panders to my inner collector/competitor gene with a range of badges to earn, complete with quirky descriptions and prizes of new backgrounds. It also has all the usual bells and whistles, allowing you to review individual runs, track progress over time and set monthly or annual goals. I first started using Strava as it was necessary last year to participate in Run Down Under – a program allowing you to track your kilometres on a virtual run around the country. 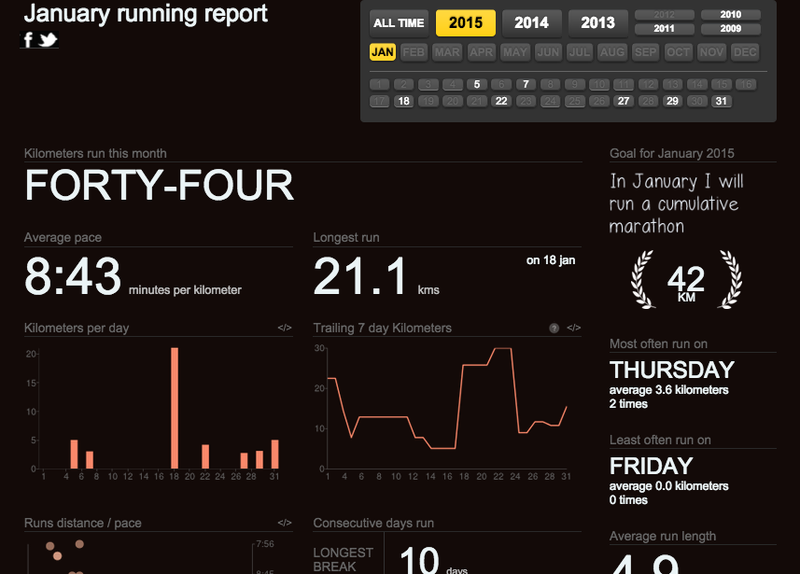 It’s another one with a slick interface and simple design, yet enough details to track your runs and monitor your progress over time. I am a particular fan of the trophies that it awards you for achieving your best time of defined distances or marked segments (see, I told you I like collecting!). The only quirk that sometimes annoys me is that it uses your ‘moving time’ rather than your actual time in a run to calculate average pace, etc, which then tends to conflict with official race statistics and every other program I track on. I downloaded this to my Mac years ago and still like it as my catch all tracker – I tend to log runs, bike rides and swims on this so I can get a more complete picture of my exercise. It also panders to my inner neat freak who likes things to be beautifully organised and set up (although I don’t always achieve that!) – sessions can be sorted, tagged and generally arranged how you like. Very flexible. Best of all, it syncs with my Garmin connect account with one click so it’s easy to get the information in there.